Researchers from the Department of Microbiology & Immunology (at Peter Doherty Institute of Infection & Immunity) together with colleagues from the John Curtin School of Medical Research (ANU) have demonstrated that specialised immune cells in our skin can ‘remember’ pathogens they have previously fought, and can rapidly multiply and attack when they encounter the same infection. Understanding how such memory T cells enter and become resident immune cells in tissues has important implications for the design of new therapies against infections as well as cancer. The study, published this week in the journal Nature Immunology, was supervised by University of Melbourne Associate Professor Scott Mueller and Dr Laura Mackay at the Peter Doherty Institute for Infection and Immunity, with co-authors from the John Curtin School of Medical Research, ANU. “This is good news as it has exciting implications for improving vaccines that may protect us from pathogens for longer periods by ensuring memory T cells stay in the tissues where they are needed to fight disease.” Said Associate Professor Scott Mueller. Memory T cells are a vital part of our body’s immune system, a subset of our armoury for infection and cancer fighting. Memory T cells have already encountered and responded to a pathogen and can be found in different tissues in the body. These skin-resident memory T cells were found to defeat invading pathogens rapidly on second exposure. “We show for the first time that skin-resident memory T cells increase in number and do not leave the skin, instead remaining there to fight the infection. 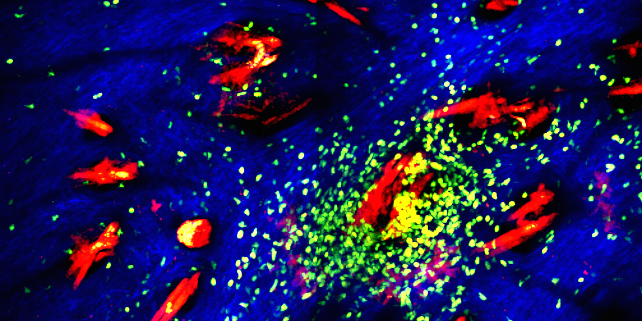 Even after multiple and different infections, the memory T cells maintained a line of defence in the skin against future infections.